Edit: this soap has since been discontinued. Today’s shave is RazoRock’s Nonno Michelino sandalwood. The scent is a rather nice rendition of sandalwood, using fragrance rather than essential oils. The strength is pretty damned good; it comes on with what I’d consider to be a bit above medium strength, but manages to stay there without any significant fading whatsoever, not only for long enough for me to finish a pass shaving, but long enough for me to start this post and finish typing this paragraph. 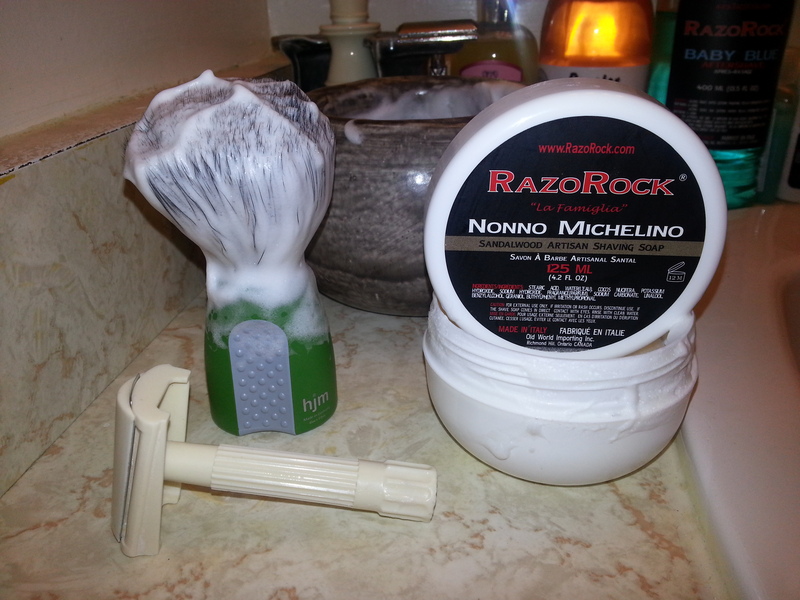 The lather quality, is also the extremely high quality I’ve come to expect from RazoRock. A rather soap “croap”, it loaded up and lathered very easily; real thick, however be sure to add sufficient water for good glide. The soap can handle the extra water without thinning out as long as you give it a bit of elbow grease. And was pretty decent in the moisturization department as well. Anyways, a rather darned fine entry from RazoRock, or more accurately Tcheon Fung Sing via RazoRock, as Paola Barile over at TFS is the producer of the La Familglia line (she’s also responsible for the Barbiere di Figaro line). Overall? 9/10. And a steal at that price. My favourite sandalwood to date. Cost:I got this one in a den-clearance sale off of /r/shave_bazaar, but it’ll normally go for $6.99 for 125 mL. Ingredients: Stearic Acid, water, cocos nucifera, potassium hydroxide, sodium hydroxide, fragrance, sodium carbonate, linalool, benzyl alcohol, geranol, buthylphenyl methylpropional.